I’m Graham Stones and I started Broken Yogi because there is nothing more valuable than feeling fit and healthy and being able to enjoy the things you love! I’ve experienced the highs of winning gold at national level in Kung-fu and having a consistent yoga practice for many years, before I became broken when I was caught in the 2004 Indian Ocean Tsunami whilst in South East Asia. Through my recovery I sought out some of the latest and most under utilised advancements in physical therapy that have been cited as the missing link to muscle and joint pain. Since then I have made it my mission to raise the standard of treatment available to yogis and other equally dedicated, active people in the pursuit of doing something positive, inspiring and good! I believe it’s vital that you keep doing what lights you up. In 2008, I got back to traveling again, this time in India for six months, where I spent two months in Mysore practicing yoga and treating broken yogis. 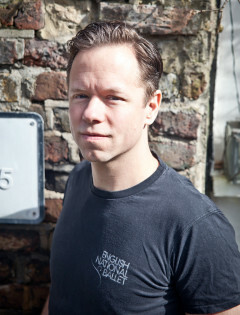 On my return I began working as a Sports Injury Therapist for the English National Ballet and running my own clinics in central London. I have developed a reputation for treating difficult problems that were not resolved through conventional treatments like physiotherapy, osteopathy or chiropractic treatment. My work now bridges the gap between bio-mechanical problems in the muscles and joints as well as addressing the health and vital movement of deeper internal structures of the body, like organs, nerves and fascia, that more often than not, play a key role in the resolution of persistent pain patterns or injury. I am now bringing my many years of experience in practicing and teaching yoga along with my experience of treating thousands of people over the years, to an educational platform through yoga anatomy workshops, so that other yoga practitioners and teachers can have access to the exciting new developments in anatomical movement relationships. My mission is to offer valuable support to the people who make our world a more positive and inspiring place to be, but are broken, in pain or stuck. Whether it’s on the yoga mat, striving for your best on stage, running a marathon or pottering in the garden. If it is important to you, keeps you fired up and does good in some way then I believe that you must keep doing it! However, my expert and insightful help is not for everyone. You will need to make a commitment to working with me and be open to discovering how you can change the way you feel for the better. If you’re looking for a treatment that simply addresses your symptoms, or works only on your back, neck or shoulders then you’re looking in the wrong place. My approach is to go deeper, to the root of your problems, through the highest standard of hands on physical therapy, yoga instruction, and specific advice. This is treatment for people who are really motivated to find out what their missing link is, so they can truly resolve the pain or injury they are are experiencing. You’re the type of person who is passionate about something, even though sometimes it’s a challenge and occasionally you get broken. You believe in testing yourself and are motivated to explore what you are really capable of, you don’t believe in sitting back and being lazy, you want to be out there doing it, feeling alive. You believe a positive attitude is essential and like to be with people who build bridges, not put up walls, because stopping what you love is not an option. You don’t give up easily and know there is a solution out there, you just need to find what resonates with you as the next step in moving forward. You don’t prescribe to the notion of using a sticking a plaster approach to the problem and don’t believe masking the pain is a viable long term solution. You like to get to the bottom of things and find out what is really going on so you are more informed and can learn from your experience and reap the hidden rewards to come out of your injury or pain. I love working with people who are body aware, passionate about what they do and eager to see what they’re really capable of. I love a challenge, something that I find particularly rewarding in my work is seeing people change their beliefs about what’s possible for them. I love working with people who think they have come to the end of the line in physical therapy. People that have tried physiotherapy, osteopathy and chiropractic treatment but don’t know where to turn to next. I love great service, it shows intelligence, respect and values you as the customer, so I always try to meet the highest standards in service to my clients. After all, without you I couldn’t do this amazing work and continue my lifelong obsession to understand more about the body. I love seeing people support one another and coming together to overcome difficulty, we all need more of this in our lives! This is not a place to go it alone. When I am working with the English National Ballet I love seeing the support and respect they have for each other and for us, the medical team – it’s really inspiring. In my clinics I aim to bring the same sense of warmth, support and enthusiasm to you through my therapeutic skills and advice. We’re all trying to be the best we can be, whether that is on stage at the Coliseum or on the yoga mat – I’d love to be an essential part of your team to help you move further along your journey. If you’re interested in discovering the exciting new possibilities that are available to you through new research and pioneering approaches, to help change seemingly complex symptoms and are committed to moving forward, then I would love to hear from you. I love my work. What I get most excited about is seeing the surprise in people as they discover movement that they never thought they could have. I was petrified, mainly because I thought I'd never get rid of the pain in my back and I felt I'd hit rock bottom. I’d given up on my GP, was worried about the amount of painkillers I was taking, but then came across Graham Stones at the Light Centre. I don't know what I would have done if I hadn't found him, I can never thank him enough. You really can be pain free. This year in August I completed a 240 mile cycle across Ireland, when I first met Graham Stones that really was unthinkable for me. My next goal is a half marathon. What I get supercharged about in my work is when I hear clients say they are doing things they never thought possible before. Symptom change is really just the tip of the iceberg, but it’s where most practitioners stop and where most people are satisfied to set their limits. I strive for your impossible, I want you to surprise yourself at just how amazing you really are! When I first met Catherine she had a lot of back problems which probably stemmed from a horse riding accident she had many years earlier. It took a few sessions, but one day she came into my treatment room and told me she had booked a horse riding holiday, something she never thought she would do again. Her change is inspirational and now she is doing things she never would have thought possible before. I love it, for me this is what my work is all about!